Doug Workman sniffing out the powder stash. 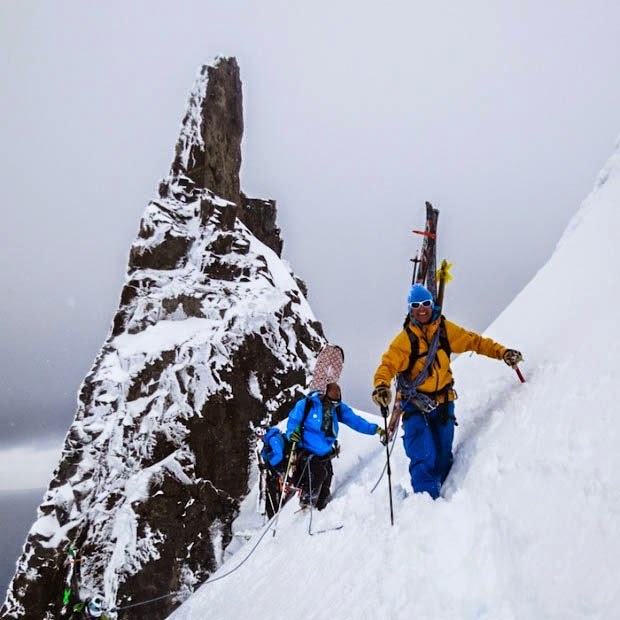 On November 4th 2014, Mammut ambassadors Doug Workman and Todd Offenbacher set sail on the Sea Adventurer chartered by Doug Stoup’s Ice Axe Expeditions (http://www.iceaxe.tv). 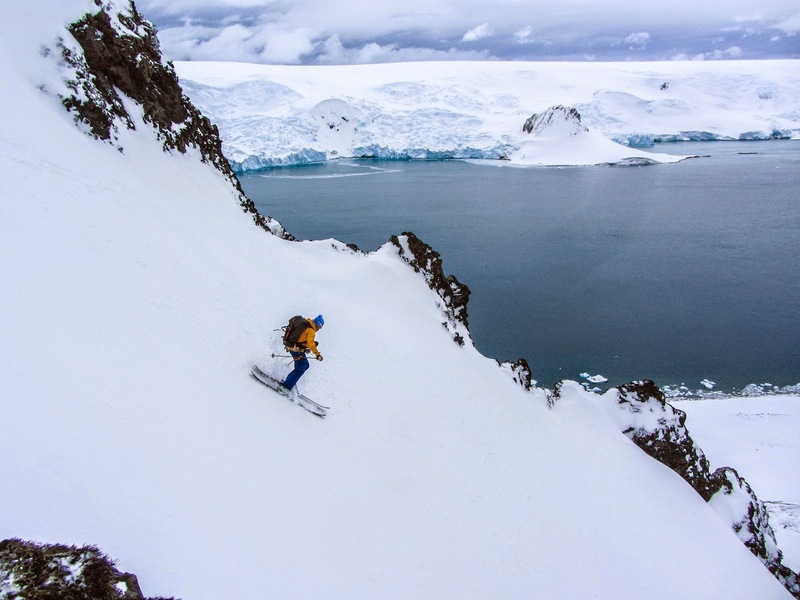 This is the fourth trip by Ice Axe to take a group of skiers to the Antarctica Peninsula for ski mountaineering. Workman and Offenbacher guide clients on the wildest ski adventure in the world. “It’s like skiing on the moon but with better snow,” says Offenbacher. 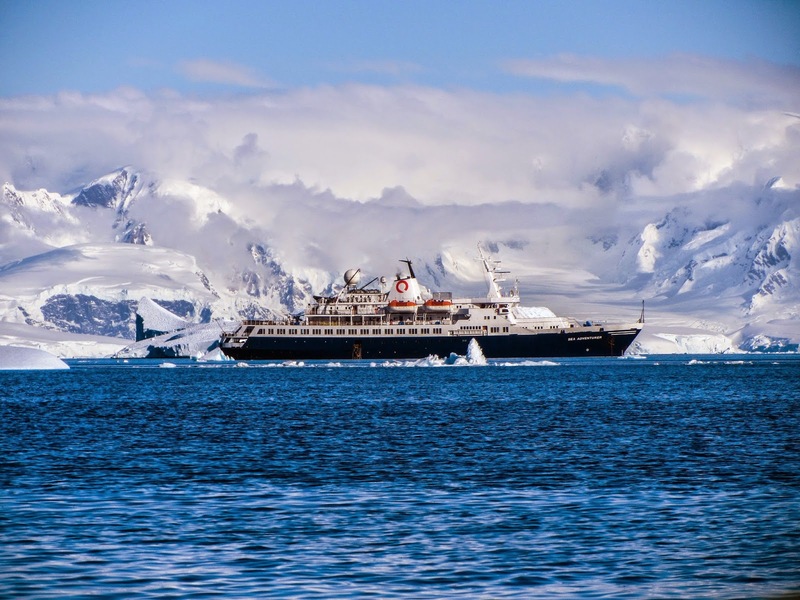 Antarctica’s only floating ski lodge the Sea Adventurer. Guests experience a warm bed and hot meals on board the 98 meter ice breaker the Sea Adventurer. The converted Russian research vessel acts as a floating ski lodge for the duration of this 13 day voyage. 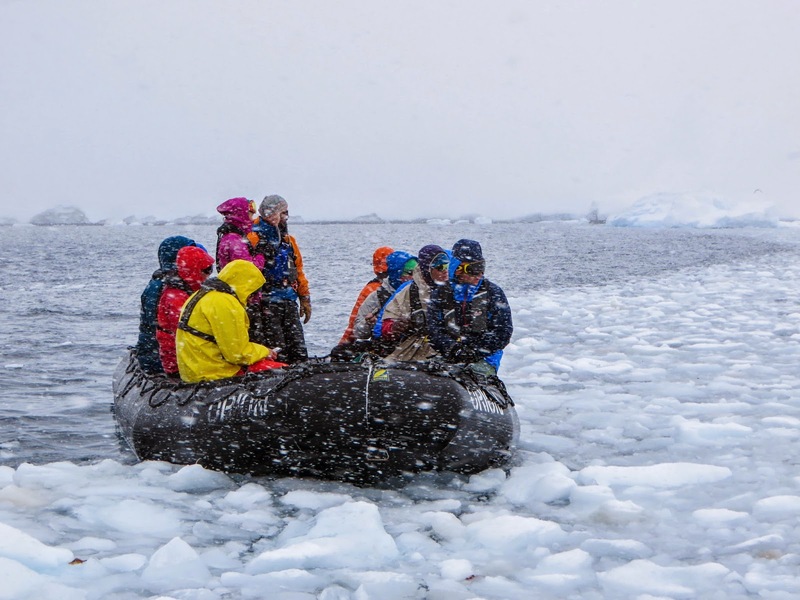 Ice Axe charters the ship and offers quite possibly the coolest ski trip in the world. “We guide all abilities from your movie star Seth Morganstein types to hard charging 70 year olds.” There is a presentation by a guide, historian, or biologist each evening for the apre-ski, or there is dancing in the bar on the bow (other end of the ship). Workman and Offenbacher co-guide this trip. Each guide has 4 clients. The guides help with loading and unloading of the zodiacs, as well as all other on mountain responsibilities. Each zodiac can hold up to 10 people so the system works well--two guides and eight clients per boat. The challenge is finding good landings for the zodiacs. Often times the terrain is challenging to access due to glaciers, and seracs. “ Stoup has explored the Peninsula over a dozen times and his guides have collected a database of ski runs and landings over the years. There is always the adventure of the unknown as ice conditions change from year to year, but Ice Axe really has their program dialed,” says Workman. Todd Offenbacher approaching the Garre Coulior, Livingston Island. The ski terrain is great. The snow conditions are everything from corn to powder. Ice Axe continues to open up new areas with first ascents and descents. “It is often hard to know if something has been skied before. It’s an on-sight for the guides to find good lines and quality snow conditions, often times in new locations. Despite being graced by pro skiers and film crews, a trip to Antarctica is more about skiing in an amazing setting with incredible people than trying to get a first ascent descent. It’s likely that more people to have climbed Mt Everest than have skied Antarctica. It was the 5th ski trip to Antarctica for Workman and the 3rd for Offenbacher. It is a bucket list trip for any skier. 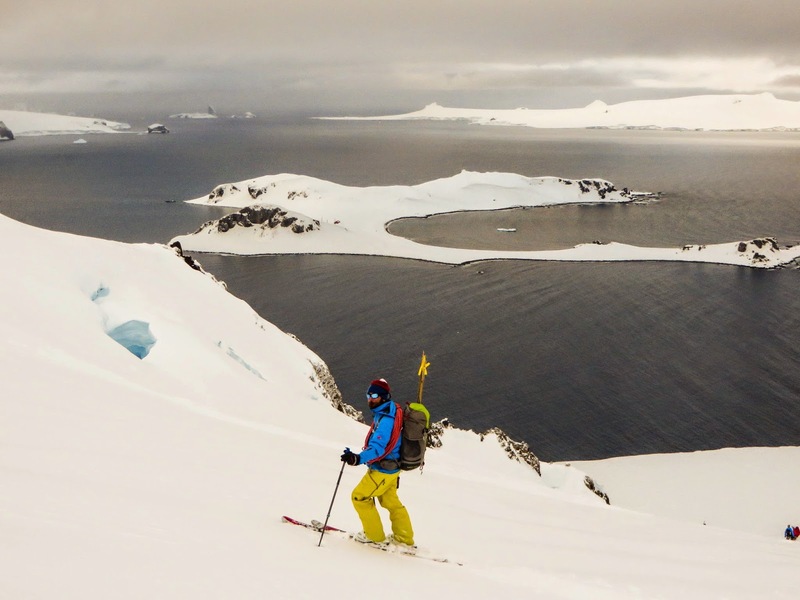 Ice Axe has charter another ski expedition to Antarctica November 7th-19th 2015. Mammut equipment which proved particularly valuable on this expedition included the Mammut Realization Pants with integrated harness, Mammut RescYou, Spindrift Pack, carbon fiber probe, and Mammut ropes. Todd! Awesome adventure! Way to go Todd! !